are these chalkboard panels?? i think i would like a more fluid block of wall with the chalkboard paint but i guess this makes it a little less permanent! i'd love to have a room i can paint one side of with a silky satiny black paint. hey hun! i think they are. from pottery barn? and quite pricey as a matter of fact. chalkboard paint is much cheaper but our new apt walls are textured so not a great writing surface. i'm not sure what we'll do yet... might just have to settle for a small chalkboard for now. 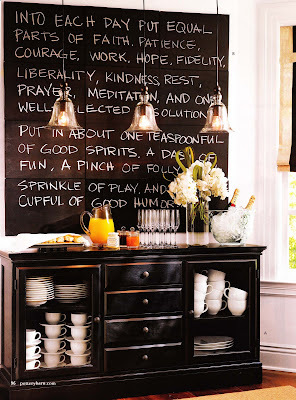 oh martha stewart actually has a great way to make your own custom colored chalkboard paint. its pretty cool. I have many loves in life and each day brings a new passion. Each passion becomes the ambition that is the engine of my life. Know what you love and enjoy it each day that you're given. Love today.